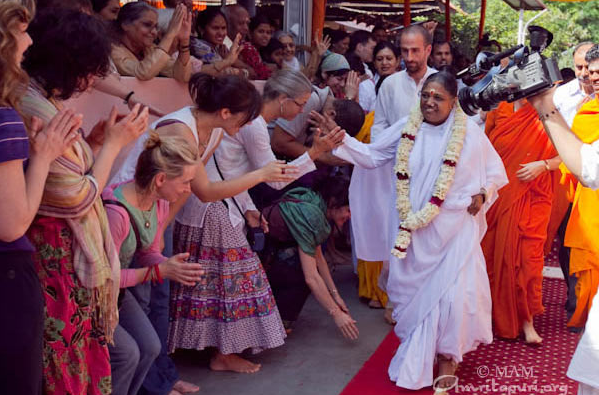 Mata Amritanandamayi is a great spiritual leader, who is affectionately known as ‘Amma’ by her followers. People have a lot of reverence for her. She was born as Sudhamani on 27th September1953 in a small village of Parayakadavu. Also called the “hugging saint” by the people, she is a wonderful woman with a beautiful soul. 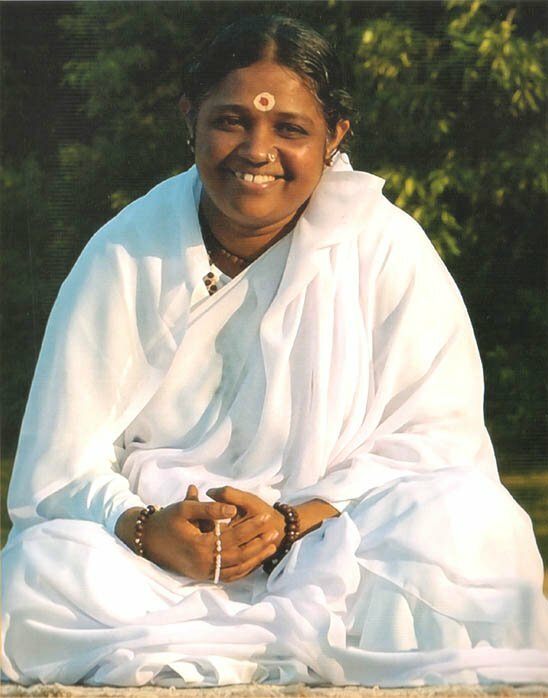 Well, in this article, I will present you with the biography of Mata Amritanandamayi Devi. On the morning of the 27th of September 1953, in a small poor fishing village, Parayakadavu in the Quilon district of Kerala, a baby girl was born. Her parents gave her the name Sudhamani. She came into this world not in tears as babies usually do, but with a beaming smile on her face, as if prophesying the joy and bliss she was to bring to the world. Sudhamani spent the years of her childhood and teens immersed in intense spiritual practices in order to present a living example for the world. Even as a small child, she could often be found absorbed in deep meditation, totally oblivious of her surroundings. By the age of five, she had already begun composing devotional songs laden with deep mystical insight. ‘Amma’ as she is known all over the world today, has inspired and started innumerable humanitarian services. She has earned international recognition for her outstanding contributions to the world community. She is recognized as an extraordinary spiritual leader by the United Nations and by the people all over the world. Though Amma makes no claims herself, those who watch her closely notice that she is the greatest example of her teaching. Her disciples and believers imbibe her teachings by just watching her. For the past 35 years Amma has dedicated her life to the uplifting of suffering humanity through the simplest of gestures – an embrace. In this intimate manner Amma had blessed and consoled more than 25 million people throughout the world. Amma spends most of her waking hours receiving the distressed and all who come to her for comfort, day after day without a break. “From birth itself I had an intense love of the divine name. I would repeat the Lord’s name incessantly with every breath, and a constant flow of divine thoughts was kept up in my mind irrespective of the place I was or the work I was attending to”, says Amma. At the tender age of five she used to sing beautiful songs on her beloved Lord. Often she went into the woods, to sit alone and meditate. Or, during normal childhood play she might stop and become withdrawn and meditative. Her parents would scold her for not being playful. They wanted her to fit in with the other children with the village. The family was also disturbed by her constant singing and chanting, and it bothered them that her lips were constantly moving, as if she was talking to herself. This was odd behavior for a small child, and they feared that she had some mental illness. The family didn’t understand that Sudhamani’s lips were moving in silent prayers. Because of Sudhamani’s dark skin, and her strange, unchildlike behavior, she was viewed by her parents as inferior to the other children. Her schooling ended when she was nine and she had to take care of the domestic work full-time. In addition to the arduous job of looking after her own family, she served the elderly, the poor and sick neighbors with love and care. Her parents were horrified to see her mingle with untouchables and forbade her to give away any more of their food, but she continued to do so despite their punishments. Some villagers called her “the crazy girl” given that she worked and sang in longing worship, often slipping into profound God-intoxicated states. Amma never had a spiritual mentor or guru, nor was she exposed to philosophical books. Her unmistakable Self-realization and wisdom seemed to spark from a constant remembrance of God. The greatest miracle that takes place in her presence occurs in the hearts of those who come to her – the gentle, gradual awakening of love, compassion and selflessness, an awakening of one’s own inherent divinity. She says, “ Mother is just an offering to the world and wants to be available to everyone.” Anyone who watches Amma on a day- to-day basis will understand the significance of this statement. Amma always says that the purpose of human birth is to realize the Self or in other words, “ to realize who we really are”. This goal lies in the heart of all her institutions. Through the example of her own life of tireless service to humanity, Amma inspires her children to walk towards the goal of self-realization by serving the poor and the needy. She has inspired many humanitarian activities that have drawn the attention of the world community. In recent years, Amma has addressed the Parliament of World’s Religions in Chicago, the United Nations in New York and the Global Peace Initiative of Women religious and Spiritual Leaders, conducted at the UN in Geneva, where she gave speeches on the present day social problems and their solutions. It was there that Amma was awarded with the 2002 Gandhi-King award for Non-violence. way those who give, those who receive, and those who look on–all are transformed by the selfless love and sense of universal kinship, blossoming in an experience of essential unity—the oneness in the Self. Amritanandamayi’s world-wide charitable mission comprises a program to build 100,000 homes for the homeless, orphanages, relief-and-rehabilitation in the face of disasters such as the 2004 Indian Ocean Tsunami, free medical care, pensions for widows and disabled people, environmental-protection groups, slum renovation, care homes for the elderly, and free food and clothing for the poor, amongst others. These projects are managed and run by various organizations, including the Mata Amritanandamayi Math (India), the Mata Amritanandamayi Center (USA), Amritanandamayi-Europe, Amritanandamayi-Japan, Amritanandamayi-Kenya, Amritanandamayi-Australia, etc. All the organizations collectively are known as Embracing the World.